Britney’s Femme Fatale is excellent, and unexpectedly so. It’s produced by Dr Luke, surely one of the most overexposed producers today, but, while it certainly uses plenty of Dr Luke’s current favorite tropes, it’s different in interesting ways from, as well as being much better than, the rest of his current product. Evidence of Dr Luke’s versatility? Or of Britney’s godlike genius, her mysterious ability to bring out the best in her collaborators, even when she doesn’t appear to have any obvious input through the rockist-approved methods of songwriting or production? Dr Luke’s ubiquity gives us plenty of other material against which to compare Femme Fatale, and so to isolate its particular genius. The two best points of comparison are Katy Perry and Ke$ha, Dr Luke’s other two flagship artists. They all share Dr Luke’s thudding, monotonous beats, but the meaning of this monotony becomes different in each case. Ke$ha deals with this by adopting a vocal style (and writing lyrics to emphasize it) that lurches drunkenly around the beat, skipping ahead of it then getting confused and dropping behind. This is why Ke$ha’s songs always have an air of desperation, a sense that partying might be an escape but is also something remorseless to be escaped from. Katy Perry has none of this ambivalence, throwing herself with gusto into Dr Luke’s sledgehammer beats. As with Ke$ha, Perry’s songs work on a relationship between the beats and the voice, but where Ke$ha builds up a tension between the two, Perry’s voice reinforces, indeed endorses the beats (a point well made by the “official lyrics video” for “Teenage Dream”). What gives Perry the authority to give this kind of imprimatur to the beats is the organic humanity of her voice, as set against the mechanical repetitiveness of the beats. The naturalness and authenticity of Perry’s voice is always foregrounded (unlike Ke$ha, her voice is almost never processed in a way that draws attention to the artificiality). Her voice thus naturalizes the authoritarian dimension of the rhythm, re-iterating their command as a kind of natural, bodily discipline. It is in this way that Katy Perry’s music is fascist; an aesthetic of fascism it shares with the films of Leni Riefenstahl. Žižek rejects the idea that “the mass choreography of disciplined movements of thousands of bodies: parades, mass performances in stadia, etc.” in Riefenstahl is fascist in itself, because “such mass performances are not inherently fascist; they are not even ‘neutral,’ waiting to be appropriated by left or right. It was Nazism that stole them and appropriated them from the workers’ movement, their original site of birth.” But Žižek misses the point that there are fascist and non-fascist forms of bodily discipline, and Riefenstahl’s is indeed fascist. We can see the distinction by comparing Triumph of the Will with Man with a Movie Camera. The discipline in Triumph of the Will glorifies the body as organic, making the body part of an ordered whole in which, as in an organism, the parts are given their purposes by their relation to the purposes of the whole: the army marches in a single direction, at the command of a single voice. Fascist discipline instrumentalizes the body. Man with a Movie Camera also involves mass coordinated movement of bodies, but in a rather different context. In this scene, where would-be swimmers coordinate their movements as they learn to swim, discipline isn’t directed towards any larger purpose, indeed, it is an element of play, the opposite of purposiveness. This, indeed, is what’s most startling and liberating about Man with a Movie Camera: it is a hymn to the modern industrial city and worker which rejects productivism throughout. 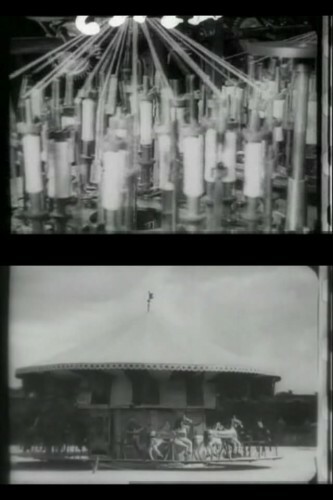 Vertov makes this point most specifically through an image that is repeated, with modification, throughout the film, a spinning wheel which occurs as cogs, as part of the mechanism of a textile factory, and as a merry-go-round. With this image, Vertov associates the circular, non-directed character of machinery with the non-teleological nature of play. The productivist associations of factory machinery make this seem odd, but it probably shouldn’t; machinery is, after all, automatic, functioning as it does without any direction of its own. Vertov is here dramatizing what we Derrida calls the commodity’s “automatic autonomy,” and suggesting this as an image of purposelessness which technology under socialist control would make available to humanity. Thus the great difference between socialist organization of the body and fascist organization of the body: to put it schematically, socialism rebuilds the body as part of the machine and thereby frees it for purposeless leisure, while fascism builds the machine into a great body and subordinates us all to that body. Which brings us to Britney. Rather than setting up a a division between mechanical beats and organic voice, Femme Fatale integrates the two by taking up Britney’s voice and making it part of the machine. As the Rolling Stone review point out, “on nearly every track, Britney’s voice is twisted, shredded, processed, roboticized,” to a fairly remarkable extent. Perhaps the most obvious example of this distortion is the duet between Britney and her autotuned double in the genuinely strange “How I Roll,” or the spoken breakdown in “(Drop Dead) Beautiful” (which I’ve excerpted here as it’s otherwise one of the less interesting tracks on the album), which out-Ke$has Ke$ha. But drawing attention to the distortion draws attention back to the organicism of the undistorted voice; I think the vocal production works best slightly more subtly in “Inside Out,” one of the best tracks on the album, in which Britney’s voice fades in and out of distortion, and in and out of the backing track, getting lost among both the thudding beats and the bleeping and twinkling synths (which are reminiscent of both Britney’s earlier “Piece of Me” and Sky Ferreira’s “One”). I think Alex Macpherson said something on Twitter about the way “Hold it Against Me” plays its dubstep bass off against the pop sweetness of its superstructure, and that’s something that occurs throughout the album. At the same time as Britney’s voice is drawn into the artifice of the production, the monotony and remorselessness of the beats is transcended and freed, becoming the artificial autonomy of the machine, producing musically a similar effect to the one Vertov produces cinematically. On Femme Fatale, Britney becomes “a commodity, like every other article of commerce, and … consequently exposed to all the vicissitudes of competition, to all the fluctuations of the market,” and suggests a possible way out through this commodification. For my part, I am convinced that it would be as easy to change a blonde into a brunette as a fool into a man of genius. — Rousseau In other Britney news, nice to see the Daily Mail targetting her for a bit of health-as-discipline propaganda.